An in-depth examination of the fractured church-state divide, challenges to the independent judiciary, resurgent nineteenth-century science and socioeconomic Darwinism, as well as revisionist history that have marked U.S. right-wing politics. ...a union of government and religion tends to destroy government and degrade religion. At the very moment that neoconservatives profess the intent to export democracy to the Middle East, right-wing activists have agitated against U.S. representative democracy. 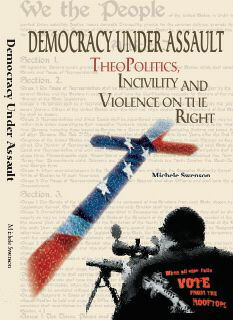 Democracy Under Assault delineates the alliances that comprise the right-wing political machine, as well as battlegrounds of the culture war waged by biblical literalists against mainstream Christians, secularists, and other religions. Firmly rooted in nineteenth century science and economics, the political right are heirs to the Nativist movement that defined America a Christian nation. Advancing survival-of-the-fittest capitalism, they embrace bio-determinism that holds futile the redress of poverty and injustice in the face of alleged genetic inferiority. This book is far too rich in detail to be summarized in a review of reasonable length...I wish I had written it.